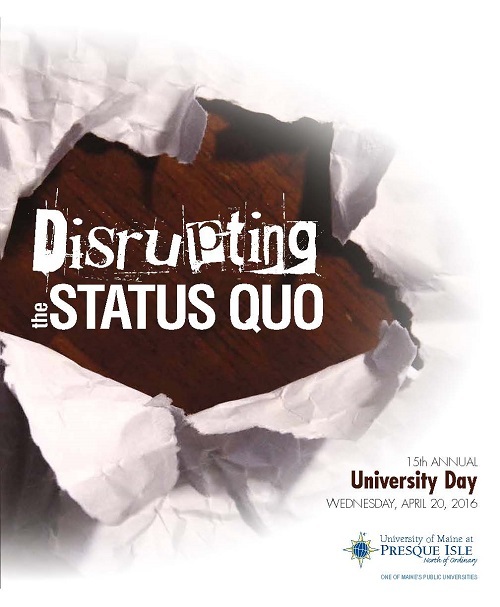 From “response to intervention” strategies and the Maine State Lottery to antibiotic resistant genes and women redefining culture, students at the University of Maine at Presque Isle will showcase their academic research, scholarly work and community service on Wednesday, April 20, during University Day. 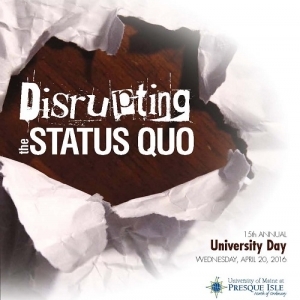 The theme of this year’s event is Disrupting the Status Quo. University Day is an event that heightens students’ awareness of the work being done by peers in all of the disciplines represented on campus. The annual campus event allows students to better understand how disciplines interrelate and how the academic work they do applies to the local and global community. It is also an opportunity for students to experience a professional conference format. No regular classes are held during University Day, but in their stead, students are encouraged to attend student-led presentations and talks held during six sessions throughout the day. University Day officially kicks-off on Tuesday, April 19, with a Distinguished Lecturer Series presentation by Jim Keady, a nationally renowned educator, activist and filmmaker who has been featured in the New York Times, Newsday and Sports Illustrated and who will share stories of his experiences and his decade-long effort to end sweatshop abuses. Keady will deliver his talk, Behind the Swoosh, at 7 p.m. in the Campus Center, discussing his efforts to improve the living and working conditions for Nike’s overseas factory workers. His talk is free and open to the public. The next day, approximately 130 students will present more than 60 talks and posters, covering areas of study as wide ranging as art, athletic training, biology, criminal justice, education, environmental science, history, psychology, professional communication and social work. The very successful morning poster session, which has been a part of University Day for the past four years, returns again this year. The poster session, taking place in the Wieden Hall Gymnasium from 8 to 9 a.m., and again during lunchtime, will feature more than 30 posters by UMPI students, showcasing the research they have done in environmental science, biology, criminal justice, genetics, geographic information systems, education, and social work. Students will be present to discuss their posters and answer questions. Beverages and snacks will be available. The posters will remain on display throughout the day for public viewing. To add to the community spirit of the day, the University will open its doors to the public for the entire day-long event. The University Day committee has invited students from local high schools, and community members are welcome to attend all sessions. A new component of this year’s University Day is the addition of an online “proceedings” of the event, which features in-depth abstracts for each presentation. The proceedings, scheduled to be published a few days before the event, will be able to be viewed at www.umpi.edu/uday/proceedings. A complete schedule of University Day activities can be found at www.umpi.edu/uday.